Excellent. Great location, clean and comfortable room, best wi-fi and TV (including Foxtel) I've experienced in a hotel anywhere. Friendly, helpful and attentive staff Home away from home feeling. I was very pleased with my first stay at Alto. A great experience in an intimate hotel. Will definitely stay again when staying in Melbourne City. Very pleasant stay, staff were very polite and friendly. Most accommodating too, we appreciated being able to leave our car a little longer in the carpark after we had checked out. Thank you. Our room was small but very nice, clean and very quiet. A very good hotel with pleasant staff. There was outside noise that impacted from the air conditioning units. There was also a lot of building noise at night, which would have been good to have known about before our stay as we had just come off a 26 hour flight. There are apartments being built all over the city with some in a nearby block. However they are not permitted to work past 7pm. 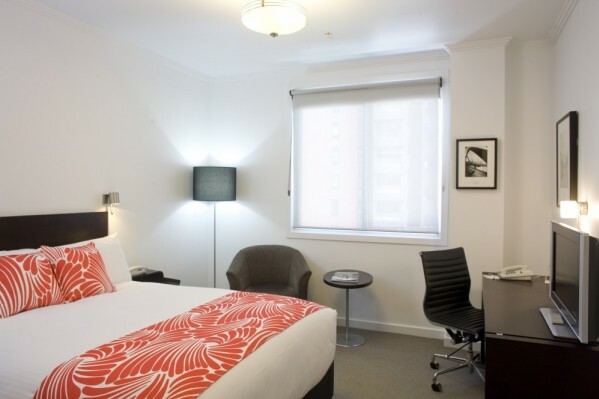 Our air conditioning equipment is located in our basement and rooftop areas away from guest rooms. We shall investigate if the nearby office building had accidentally left their system on overnight. Our reception is open 24 hours to assist with any inquiries and will do our utmost to resolve, especially if we are made aware of illegal building works. I love the Alto Hotel - appreciated the Myki card. Good location for us! 3 bedrooms and bathrooms were very helpful with a group of 6 mums! Clean rooms. Excellent quality premises with very attentive, friendly staff. Excellent location for travelling from regional Victoria by train. Very much appreciated the room upgrade! Really comfortable stay with a special mention for a great bed. Great location, very comfortable and good rooms. as usual, good - sometime the rooms are little noisy. We really enjoyed our stay at Alto Hotel On Bourke. It was very quiet, and that is very important to us. Staff was friendly, and the breakfast (buffet and cooked) delicious. The location is fantastic, close to Southern Cross Station (for the SkyBus from and to the airport), a tram station and a short walk from the city centre. fantastic evening meals. Enjoyed the opportunity to have some decent coffee at my convenience. The beds are so comfortable and the location very handy for the city's attractions. Couldn't have found anywhere better to stay. Getting there from the airport by bus is brilliant. Extremely good. Everything we needed was provided. Thank you. Very pleasant, great staff and great location. Great. Very comfortable. Staff were especially helpful. Enjoyed the stay. Staff were helpful and friendly. Wish the lounge, bar area was bigger, so that we could all meet and have a couple of drinks. The room was lovely and very clean. The rooms were quiet, not much noise in regards to hearing anyone else. Decor in the hotel/rooms were good. Would stay again. A nice alternative to the larger hotel chains. Noise was an issue initially but addressed by very accommodating staff. We loved this hotel - especially the environmental focus and the full kitchen. Alto is a great location, was very clean and the bed and pillow were really comfy. Slightly poky but if you are not spending a great deal of time in your room not a problem. Staff serving the breakfasts were very nice but the Reception staff were hit and miss. For example, we come in during the evening and stand at the lift and look over and a few of them a few times just looked at their computer screens rathre than say Hi, had a good evening etc. Seemed rather surly. Plus, you'd think they would be looking up at who is around anyway from a security perspective! We enjoyed our stay for sure. Great location, comfy bed, nice, clean room. Love the free espresso machine & the free relaxation room with the lovely massage chairs. The staff were polite & helpful, particularly Andrew on Reception, who was an absolute pleasure to deal with. He was so polite & friendly & very happy to help us & give us tips on things to do. I have already recommended my parents to stay there on their trip in January & this will now be my choice for all of our trips to Melbourne. While we may not be able to take direct action for people on public land our reception is open 24 hours a day to assist wherever possible. In this instance if we were made aware of the disturbance we would have contacted relevant authorities as well as making a direct request for the people to be considerate or move on. On review of our CCTV while people walked/ran in the rain along the street / lane there there was a a group of people in the areas from 4:20 to 4:30am. I always enjoy it. The staff are very friendly, the rooms are very nice and its convenient.